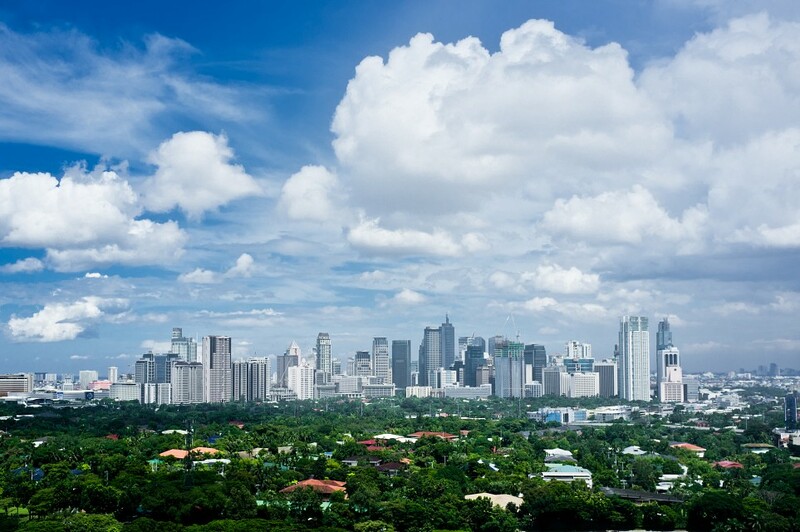 Makati City is one of the better known of the 16 cities that Metro Manila is comprised of. 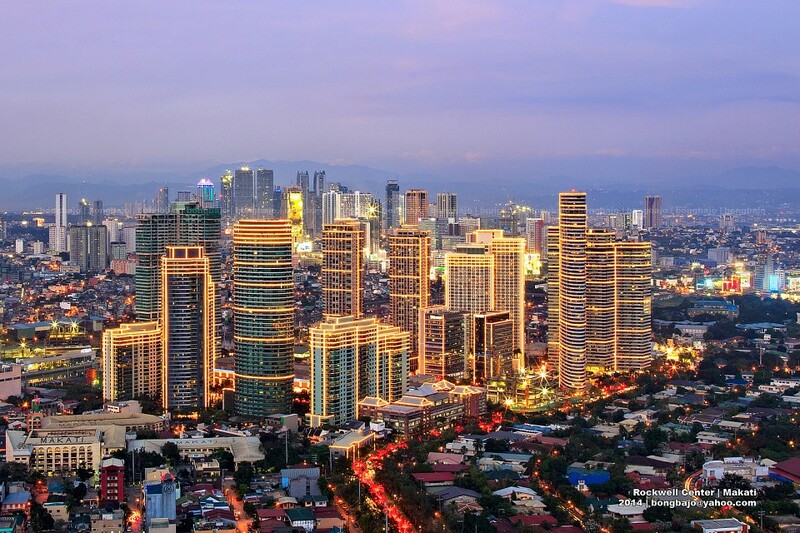 As the Central Business District of Metro Manila, it has a high concentration of high-rise architecture, and is located near the cities of Taguig and Ortigas. While there are many skyscrapers in Makati, none of them can be classified as super-talls which require 300 m minimum in height. Not only is Makati the 'Financial Capital of the Philippines', it is also home to 46 embassies and 3 consulates including the United Kingdom British, Australian, Canadian, German, Singaporean, Malaysian, Norwegian, Thai and more. These are located right in the city center which make it easy for foreign visitors to visit and request for information or assistance. Makati was originally named by Miguel Lopez de Legazpi and is said to have come from the word 'kati' which in Tagalog means 'tide' or makati' meaning 'ebbing tide'. It was inspired by the tides of the Pasig River which is the city's boundary on the north side. During the Spanish times, the Church of Saints Peter and Paul was built in the poblacion. In 1670, when the place formally became a municipality, it was called 'San Pedro de Macati' in honor of the patron Saint Peter. Don Jose Bonifacio Roxas (ancestor of Zobel de Ayala family) bought San Pedro de Macati in 1851 for PHP 52,800. Since then, the Zobel de Ayala family has been responsible for augmenting the development of Makati. The main arteries connecting Makati to the surrounding Metro Manila is the notorious EDSA circumferential and Skyway, which is part of the first true grade-separated highway in the Philippines, the latter being a toll road. Makati is sometimes used as the showface of the Philippines, since it is one of the largest urban areas in the Philippines not dominated by poverty. 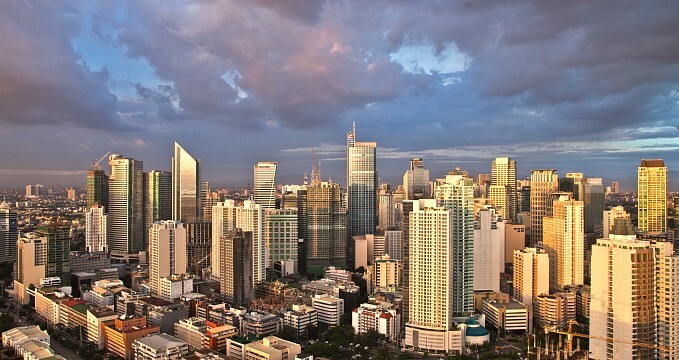 The current Makati CBD is built on the grounds of a discontinued airport, with the main thoroughfares, Ayala Avenue and Paseo de Roxas, being converted runways. The third important thoroughfare, Makati Avenue, runs perpendicular to Ayala Avenue. Another important street is Gil Puyat Avenue , which historically divides Makati in the upscale southern CBD and the less affluent northern part of Makati. This latter area is known for hosting one of the larger red-light-districts of the Philippines along Burgos Street. The divide between these two areas of Makati is becoming less pronounced; the tallest high-rise residential skyscraper of the Philippines, Gramarcy Residences, has been erected on the northern part near Makati Avenue. With its low wages, the Philippines has a large telemarketing and customer service employment in BPO (Business Process Outsourcing), with Makati being the focal point. Greenbelt - an upscale shopping mall with 5 sections (Greenbelt 1 to 5) with shops, cinemas, restaurants, cafes and fast food outlets. Designer retail shops include Hermes, Louis Vuitton, Balenciaga, Bulgari, Gucci, Prada, Kate Spade, Marks and Spencer, Lacoste, Jimmy Coo, Ferragamo, Patek Philippe, Rolex, YSL, Paul Smith, Liz Claiborne and more. Greenbelt is connected to Glorietta 1 to 4 and Landmark by walkways and bridgeways. Glorietta - recently renovated upscale shopping mall with 5 sections (Glorietta 1 to 5 or G1 to G5). G1 to G4 is connected to Greenbelt, SM Makati, Rustan's and The Landmark. 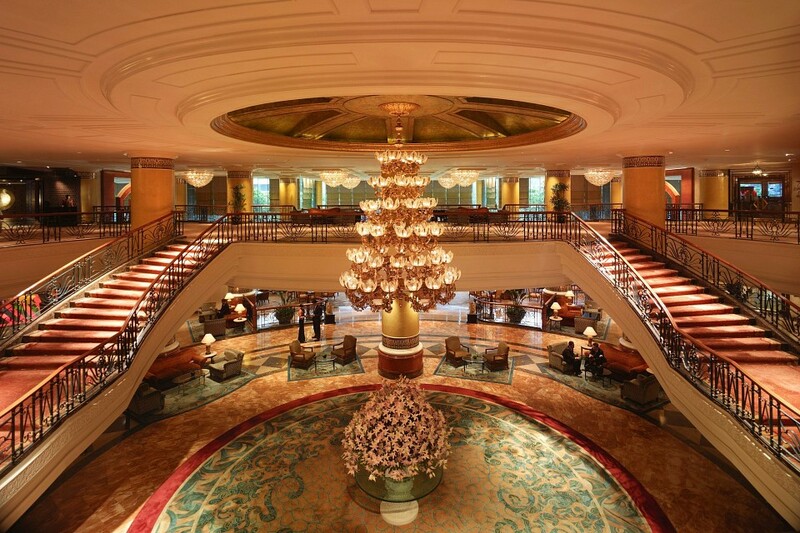 G5 is totally separate and is beside Rustan's and across Hotel Intercontinental. There are cinemas, an activity center, restaurants, cafes and retail shops such as Guess, Aeropostale, Toys 'R' Us and other local brands. The Landmark Department Store is a large department store selling reasonably-priced clothes, footwear, household items, basement supermarket and foodcourt. SM Makati is the flagship department store of SM in Makati with a wide range of very affordable items from clothes to housewares to grocery items. There are snack bars, coffee shops and a fast food center within the store. Rustan's Makati - This upscale department store carries designer brands and luxury items from clothes, shoes, accessories, house wares and decors. Its supermarket is the source of fresh items and foodstuff sourced locally and imported from different countries including many products not found in other grocery stores. Power Plant Mall in Rockwell Center - a four-story high-end shopping mall located in the exact place where a thermal power plant used to be. This classy mall has high-tech movie houses, bowling alley, cafes, themed restaurants, Rustan's Fresh grocery and prominent local and international brand lifestyle retailers like Michael Kors, Zara, Kenneth Cole, Aranaz and a lot more. Century City Makati - Opened only in February 2o14, it is a five-story luxurious mall that is said to be a smaller version of Power Plant Mall. 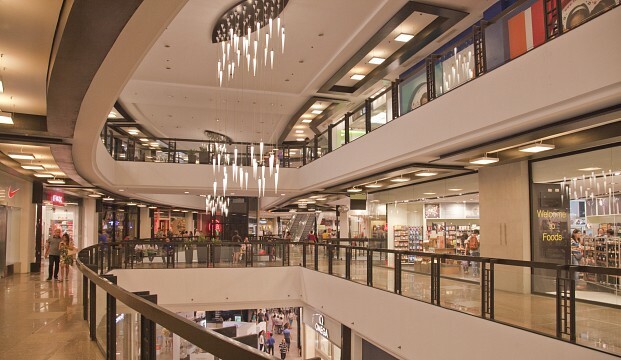 Fashion brands, cafes, restaurants, coffee shops, cinemas and Rustan's Fresh supermarket can be found in the mall. 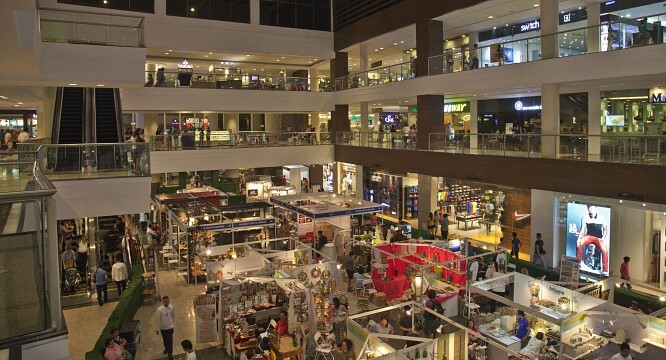 Smaller malls in Makati include Makati Cinema Square, A. Venue Mall, Paseo Center, Cash and Carry Mall, Guadalupe Commercial Complex, Makati Cinema Square, Walter Mart and more. As Filipinos are known as being food-lovers (even more so than other Asian countries), Makati has an abundance of restaurants, both inside and outside the shopping malls. Besides native Filipino cuisine, there is also a large number of Korean and Japanese restaurants. Since the Philippines has been an American colony not 40 years ago, there is also a relatively large number of American franchises to be found. As with the rest of the Philippines, there are also many streetfood vendors, though the quality of the food bought from these vendors is arguable in terms of hygiene and food safety, and generally ill-advised for foreigners. Fully furnished condominiums, apartments and houses are also available for short term and long term lease. There are websites where homeowners post properties for lease. The owners usually greet the guests and are just a phone call or text away to assist guests. It is necessary to use a reliable booking site and check guest feedback before making a choice. While your hotel of choice is naturally dependent on your budget, there is something to be said for not choosing the cheapest of hotels, since those are generally in hard-to-find backstreet neighborhoods of Makati with no concern for noise by both the surrounding residents and patrons of the hotel at night. Museo ng Makati - housed in the old Makati town hall; features photographs, murals and dioramas showing Makati history. One historical landmark in Makati is the Ninoy Aquino Monument located in Ayala Triangle or corner Ayala Avenue and Paseo de Roxas. Ninoy Aquino was a staunch critic of Ferdinand Marcos and was assassinated upon his arrival at the Manila Airport in 1983. His widow Cory Aquino won the election in 1985 and toppled the Marcos regime, becoming the first woman president of the Philippines. Current President Benigno Aquino III is their son. From the dilapidated NAIA, Makati can be reached quickest by taxi, either from the Skyway toll road, which puts you close to the RCBC Plaza, or the notoriously traffic-heavy EDSA circumferential; both of which takes between 20 to 40 minutes, depending on traffic and driver competence. In Makati itself, taxi is also the most common means of transportation for foreigners. While generally a safe choice, taxi drivers are notorious for trying to overcharge the customer by asking for a fixed price or a fee on top of the metered price, both of which are illegal. Taxi drivers are required to use the meter and charge only the amount on the meter. Fares start at ₱ ₱40 ($0.88), and generally stay under ₱ ₱100 ($2.20) for shorter trips. Those who are more adventurous can take the bus and jeepney which play a variety of routes that connect different areas within Makati as well as from Makati to different places within and outside Metro Manila. But buses and jeepneys usually get caught in traffic jams so those who plant to use this type of travel must allocate substantial time and patience to hurdle the chaos on the road. Still another option is to take the metro railway. This is the fastest way to go to major places in Metro Manila. It might involve some walking from the station to the place you want to go and vice-versa. There are three routes: LRT1 or Green Line goes from Baclaran, Pasay to Monumento, Caloocan then on to North Avenue, Quezon City corner EDSA near SM North EDSA. LRT2 or Blue Line goes from Recto, Manila to Santolan, Quezon City. MRT3 or Yellow Line is from North Avenue, Quezon City corner EDSA to Taft Avenue, Pasay corner EDSA. MRT3 has four stop-over stations in Makati: Guadalupe, Buenda, Ayala and Magallanes. Like many other parts of Metro Manila, Makati is suffering from an extremely congested road-network due to the lack of grade-separated highways, low-capacity roads and thoroughfares, constant road repairs, lack of traffic-law enforcement, and the aggressive and chaotic driving style of the Filipinos. Travelling time for any given distance within Metro Manila can easily be doubled or tripled compared to other cities with a better road network. One notable exception is the Skyway toll road, the first true grade-separated highway in the Philippines, however having limited reach and few ramps, it is of small use other than connecting the western part of Makati to Pasay and south into Luzon. Road congestion starts at 6 AM in the morning and only finally relaxes around midnight. While not all parts of Metro Manila are safe for foreigners, Makati is definitely amongst the safer areas. Many areas of Makati can even be safely explored at night (and due to the extensive nightlife), which is more than what can be said for most parts of Metro Manila. Traffic rules are strict n Makati and violations carry a stiff penalty. There are designated stops for buses and jeepneys and if you alight in non-designated stops, there is a fine. Taxis have more options on where they can stop although some places are still considered as a 'no-loading/unloading zone'. Makati allows no lee-ways for the number-coding ban locally called 'color-coding' that bans certain vehicles form using the road on certain days based on the last number in the plates. The anti-jaywalking law requires pedestrians crossing the street to always use the designated pedestrian lanes. Some taxi drivers have resorted to criminal activities. First, make sure your doors are locked since some drivers are in cahoots with robbers who board the taxis when they pass by and rob the passenger. Second, drivers distract the passenger with loud music while spraying a chemical that will make the passenger sleepy after which the driver takes the taxi to an isolated place and rob him. At the first sign that the driver is acting abnormally and there is a peculiar smell which can make you feel drowsy, find an excuse and tell the driver to stop and get out or open the window and wave to call somebody's attention. Hold-uppers, snatchers and pick-pocketers abound in Metro Manila not excluding Makati. Using different methods to distract you, they target bags, wallets, jewelry, mobile phones and electronic gadgets. Make sure to always keep your bags and valuables close and visible at all times. If possible, do not use high-tech gadgets while out on the road or in congested places. Avoid wearing expensive jewelry in public places and reserve them for private events or secure places. Be wary of people in malls who pretend that they are in desperate need of cash and offer to exchange your cash with gift certificates or gift checks which can be used to buy in the malls. There is a very high risk that these GCs are fakes and will not be accepted by the store. Makati has been classified under the Koppen classification system as having a Aw - Tropical wet and dry climate: very stable temperatures year-round. Mean temperature during the day is 30°C, rarely going below 18°C or above 38°C. Two seasons: Wet and dry season.